ARACHNOQUAKE: Spiders Unearthed on Syfy Cause Havoc in the Streets! Starring: Tracey Gold, Edward Furlong, Bug Hall, Ethan Phillips, Olivia Hardt, Megan Adelle, Gralen Bryant Banks, Tiara Gathright, Grant James, Lucky Johnson, Skyy Moore, Damien Moses, Jaime Wallace, Glen Warner, Nedal Yousef. Written by: Paul A. Birkett, Eric Forsberg. 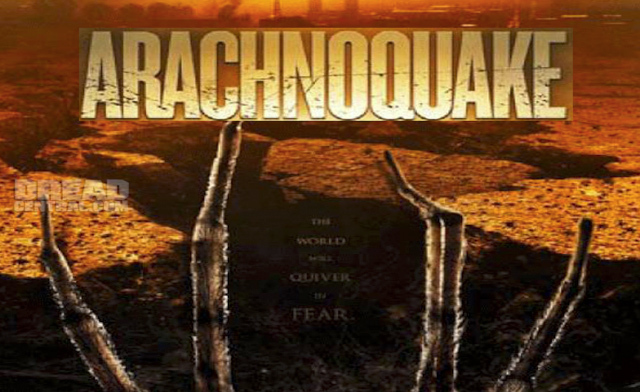 Syfy original movie “Arachnoquake” premiering Saturday, June 23rd catchphrase is “you can’t run from what’s beneath you”. In this Sci-Fi movie about large Albino spiders that have escaped from the ground after a large earthquake in New Orleans. Two of the cast members, Tracey Gold (Growing Pains) and Bug Hall (The Little Rascals) along with director Griff Furst joined in a press conference phone call to answer questions about the movie. The film also stars Ethan Phillips (Star Trek: Voyager), and Edward Furlong (Terminator 2: Judgment Day). Griff Furst who is a fan of horror and science fiction said that when he was a little kid, he “lived and breathed film and television.” But, his favorites were “The Twilight Zone”, and “Tales from the Crypt”. He’s also a fan of Stephen King novels. “Every time there’s a new release out, I drag my wife to it even though she’s not a fan of horror. I try to take everything in”. The spiders in “Arachnoquake” are genetically truly albino. Furst stated that they are blind and have been living underground for thousands of years. “Something happens where they get released, you’ll have to watch it.” The spiders have pink eyes, light skin and “the sun makes them very unhappy”. Actor Bug Hall stated that he’s always been a big “Sci-Fi geek.” He said that when he was a kid, his “go-to” channel was the Syfy channel and he loves anything related to monsters, time travel or space. Tracey Gold said the she herself is not a Sci-Fi girl, but she has four sons whom have brought her into the Sci-Fi world. “I have been inducted into the Sci-Fi world”. We asked them what would they tell people who are terrified of spiders to make them want to watch “Arachnoquake”? Hall answered “I think our spiders are definitely scary. That’s the point. But it’s also funny. They (spiders) didn’t miss the moment for comedy either. Even the spiders don’t take themselves too seriously.” Gold said that these spiders are not the typical spiders that you would see in your home. So you could possibly make the distinction between the spider you encounter and the one we run into in “Archnoquake”. Furst commented that “even if someone is terrified of spiders, that’s all the more reason to watch. That’s what makes the horror genre so successful because people like to be scared. So hopefully it does scare them in a couple of moments but then makes-up for it by making them laugh. That’s the plan”. We also asked what is the best way to kill these spiders in “Archnoquake”? Viewers can look forward to the following creative ways that were used to extinguish the dangerous arachnids. Hall joked that he uses a stick. Gold said her method was running. Director Furst said that they blew them up, torched them, drowned them, shot them, and “we kill spiders in all kinds of ways”. “Arachnoquake” premieres Saturday, June 23rd at 9pm on Syfy.